After our fabulous Nile river cruise we spent a day in Luxor at the same overlanders hotel that we had stopped by when we were driving through. They were excited to see us again, but a bit puzzled as to why we weren’t with our vehicles. As before, they cooked a lavish dinner for us, and we gorged ourselves to the point of food coma, after which we retired to our rooms to prepare for the next day’s train ride back to Aswan. We had elected to grab second-class tickets back, which provided the four of us with a booth which we and our luggage just fit into. Of course, as is usual the train was overbooked, so we had people sitting on our armrests for the duration of the journey, and had other passengers constantly walking up and down the aisle, smacking their luggage into my head as I tried to get some shuteye during our eight hour journey. Back in Aswan again after our brief sojourn, we resumed our normal routine of making phone calls, consulate visits, pizza eating, researching alternate plans, and felucca rides along the Nile. By this point we had been in Egypt for about three weeks, and had built a comfortable life amongst the inhabitants of the city. We had our favorite juice bars that we’d visit (love the fresh green grape juice), the shisha spots that we’d hit up after dinner, and an odd cast of people that we met with regularly on our quest to obtain the almighty Sudanese visas that we so desperately needed. One of those characters was Timur. Timur was the guy who had met us on our first day in Aswan and taken us for our first round of rejections at the Sudanese consulate. We had developed a good relationship with him, and met on a frequent basis to chat visas or just grab some strawberry juice together. 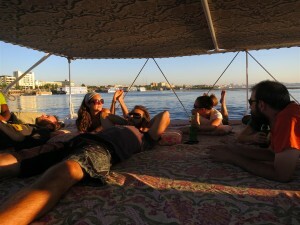 As an independent tour guide, Timur did a great job helping us arrange our day-to-day tasks around the city, book our Nile cruise, and setup our overnight felucca cruise that we had been wanting to book for a while, amongst other things. He served as a kind of middleman in many of the negotiations throughout our visa acquisition ordeal, and was an invaluable friend throughout our time in Aswan. Happy _________ to those back home! To Ann, Mallory’s father, and my parents! 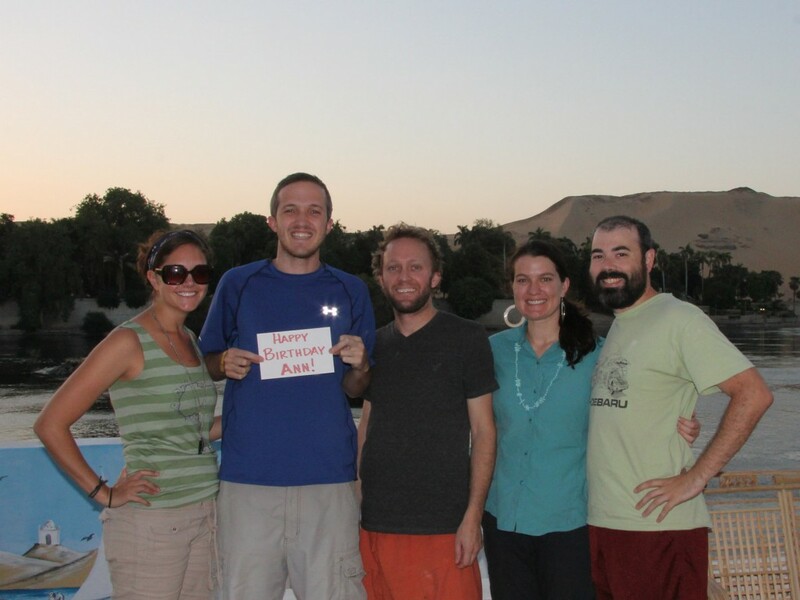 This is Mallory, by the way, the newcomer to the trip, who joined the Shoebaru team in Cairo! Cairo was an intense maze of cement buildings, noise, and people. Very crowded and endless car horns. Thankfully Em can decipher the squiggly lines of Arabic, and our Google Maps seems to read the streets of Cairo (somewhat) accurately. Camels, donkeys, and sheep roam the streets and burning trash? Well, I’ve gotten used to it. The morning after my arrival, we visited the Great Pyramids. They are incredible…just as you would imagine them to be. So incredibly large and magnificent. It’s very humbling to stand at the base of stones that were laid 5,000 years ago. Wonder of the world. Check! 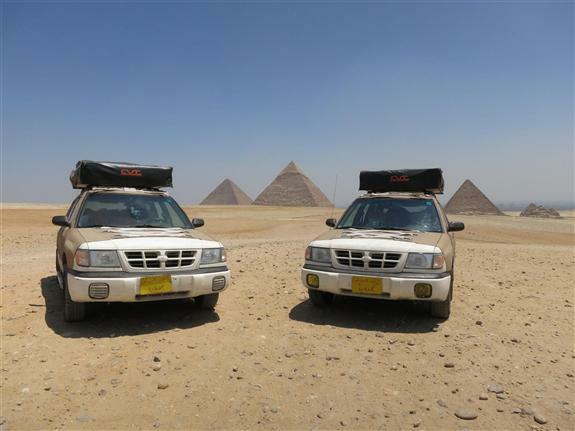 Shoebaru at the Great Pyramids! Leaving Libya took about as long as entering Libya (5 minutes). There was also roughly the same amount of hassle (none). Egypt on the other hand was about a 3 hour series of visits to small hidden offices to squabble over papers and money. If we had tracked our back and forth runs between buildings, cars, guards, etc. it would have looked like that horrible one panel cartoon, “Family Circus.” The experience was about as hilarious as that cartoon as well (not at all). Egypt is a big fan of bureaucracy. As such, a carnet is required for the country and getting that stamped and the car inspected takes time and visits to roughly 20 different individuals. 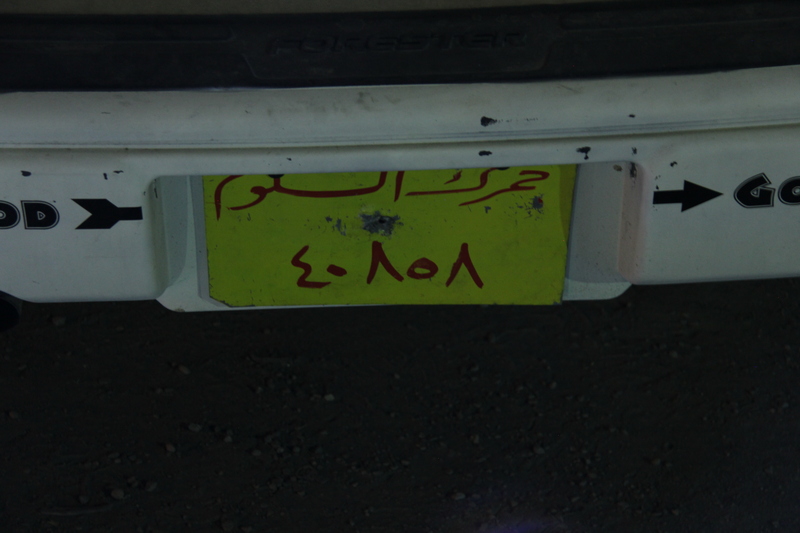 Along this comes Egyptian plates for each vehicle, Egyptian driver’s licenses for each driver, Egyptian insurance, etc, etc. In Virginia we were able to get the plates “RGT SHOE” and “LFT SHOE” for the cars. 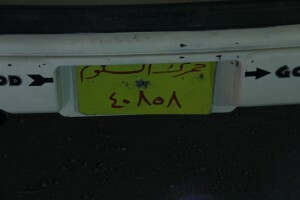 In Egypt though, we have the boring Egyptian plates. So, for the duration that we have those plates, we no longer will refer to the cars as “Right Shoe” or “Left Shoe” but as “Arba’a Sifar Thamanya Khamsa Thamanya” and “Arba’a Sifar Thamanya Khamsa Ithnan” or “Thamanya” and “Ithnan” for short. 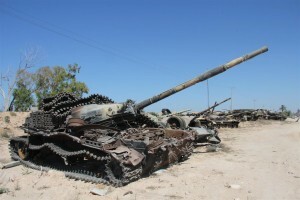 Libya is a country that if you had asked any of us a year ago if we would be traveling there on this trip, the answer would have been a flat out “no.” Due to the ever changing situations there and also in Syria, our route changed and on August 1, we found ourselves on the Libyan side of the Libya/Tunisia border…a place that few Americans have ever been. 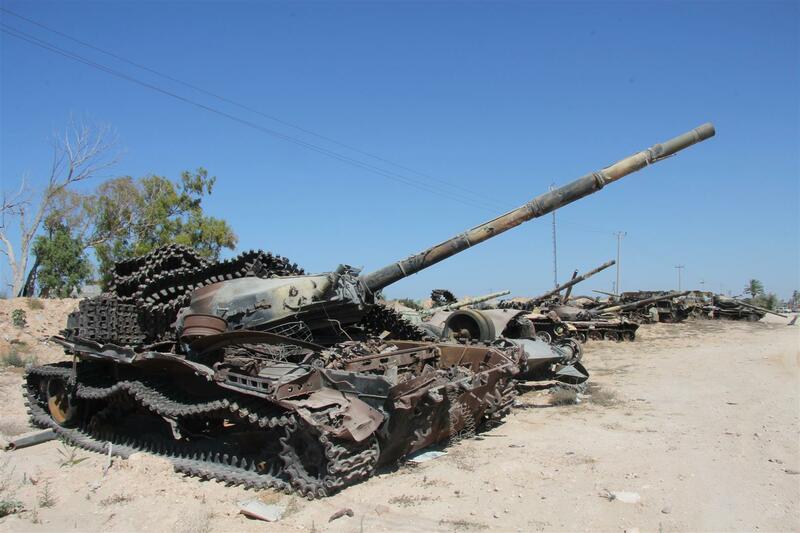 Getting to this point is no easy task as we had to convince Tunisia to let us out of the country. The border between the two nations is officially closed and the Tunisian authorities did not believe that we would be allowed entry to Libya, thus potentially stranding us in “no-man’s land,” but well within sight and earshot of them. After talking with them on July 31, they agreed to let us spend the night at the border and would let us pass the next morning. Though, the next morning took some more convincing and finally we were allowed to cross. After sorting the second new alternator, we headed south for our Tunisia ferry. The drive to Salerno was uneventful (making it somewhat eventful for us), and we enjoyed a delicious last (Italian) supper of pizza, gnocchi, buffalo mozzarella, prosciutto, limoncello, beer, and wine. It was a wonderful way to say “ciao” to Italia! 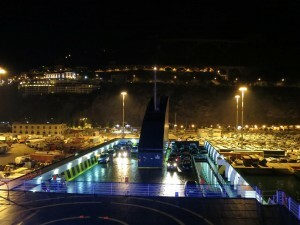 So, then there was the 24-hour ferry to Tunis, for which we hadn’t booked cabins to save a bit of money. 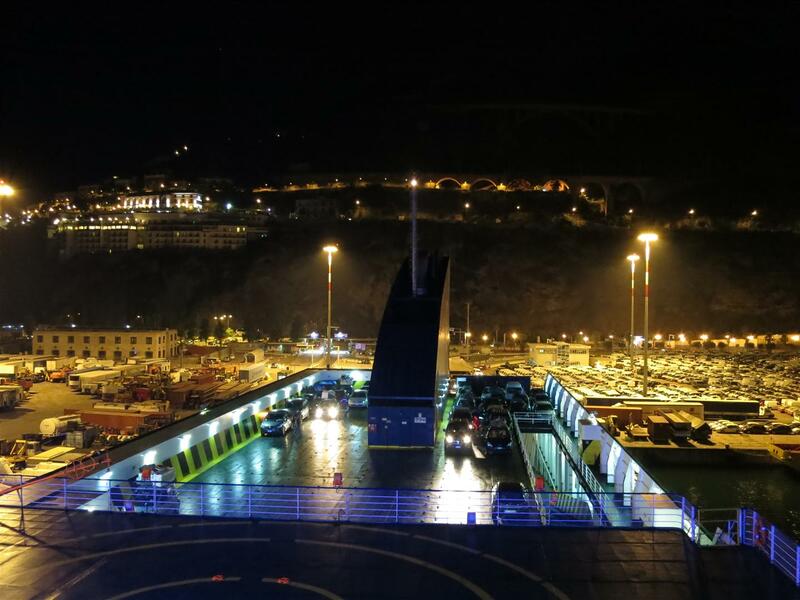 We, inexperienced Tunisia ferry passengers that we were, didn’t realize that nearly all of the passengers without cabins would bring provisions to create makeshift beds and family areas in every nook and cranny on the boat–every nook and cranny. Fortunately after a bit of hunting, we found the secret reserved seating area in the “cinema” where only one passenger had reserved a seat (Joe had to move from her seat – ha). We claimed some cushy chairs that were perfect for sleeping. For entertainment, we read, wandered around, watched bits of racy Italian television, and enjoyed cappuccinos and croissants with the Honduran barista. Try as we might, we were unable to find the advertised casino or either of the two clubs. The advertised WIFI? The Italian crew just shrugged. We did get our first taste of Ramadan as various hallways converted to prayer rooms at sunset and families packed the dining room to break their fasts.